FORT WAYNE, Ind. - Minor League Baseball is all about development. That applies not only to the players on the field, but on the front office side as well. With that mission in mind, the Fort Wayne TinCaps annually have partnered with Ball State University's Sports Administration Program. The program actually predates the TinCaps, going back to 2008, when the team was known as the Fort Wayne Wizards. In a mutually beneficial program, BSU students gain real-world experience by making sales calls to TinCaps fans who've attended games in the past. For students, it's an immersive learning project that can't be replicated in a regular classroom setting. Meanwhile, for the TinCaps, the partnership enables the team to keep contact with hundreds of fans during the winter. 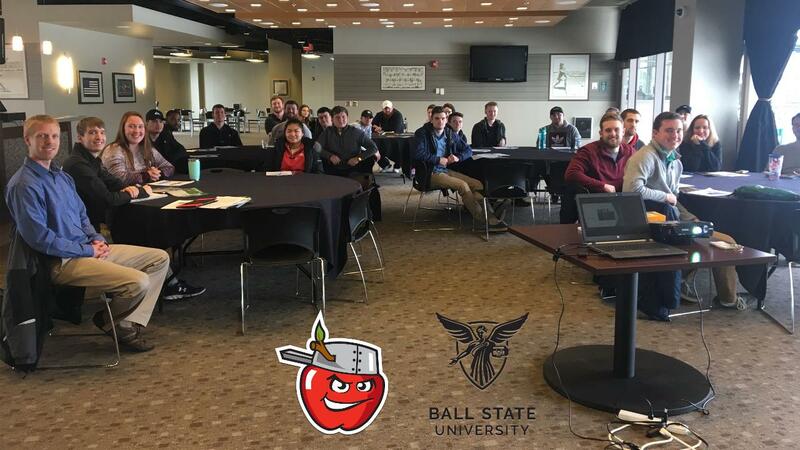 "Many sport administration graduates don't have the opportunity to make any real sales calls until they're in their first job out of college," said Paige Watson, TinCaps Director of Ticketing. "This partnership with Ball State gives students a head start in experience while still in school." As part of their professional development, students taking "Revenue Generation in Sport" also benefit from the chance to network with TinCaps full-time staff members. Over the years, the program has led to several students earning internships with the team and in some cases, even full-time employment. In fact, Watson was once a student in the class herself. The 2019 program kicked off on Jan. 18 when 26 students from this year's class traveled from Muncie to Parkview Field. Professor Eric Klosterman's group toured the award-winning ballpark and also received training from Watson. Over the course of the spring semester, other members of the TinCaps Ticket Office and Ticket Account Management staff will visit the class on campus in Muncie for additional training and oversight. "We truly appreciate the chance to team up with the TinCaps," said Klosterman, Ball State's Assistant Lecturer of Sport Administration and Coordinator of Undergraduate Sport Administration Program. "It's an invaluable experience for our students to work with a professional organization. That the TinCaps are a first-class operation and one of the top franchises in all of minor league sports just makes it that much more impactful. TinCaps staff members go out of their way to make sure this is a meaningful experience for students." "As a student, this class not only helped me gain experience that was applicable to work after college," Watson said. "But it also helped me become more familiar with the organization and the front office staff here, eventually leading to my full-time employment with the team." Watson is one of six Ball State alums currently on the full-time staff for the TinCaps. "We're grateful to have this partnership with Ball State," TinCaps President Mike Nutter said. "Just about everyone working in this industry had guidance from professionals at some point as they were coming up. We're glad to be able to pay it forward to BSU's students and at the same time, we appreciate the help they're providing us in return. It's a credit to everyone involved in the program that it has produced interns and full-time employees for us in the past and we hope that trend continues for many years to come." The TinCaps open their 11th season at Parkview Field on Thursday, April 4 (7:05 p.m.) against the Lansing Lugnuts (Toronto Blue Jays). Tickets to individual games go on sale Wednesday, Feb. 13 (8 a.m.). Season ticket packages, which range from 12-game plans to all 70 games and other options in between, and group outings, including a brand new party package, are already on sale. For more information, fans can call 260-482-6400 or visit TinCaps.com.